Creator God, ten years after terror reigned we mourn still. We grieve for the civilians killed in a crime against all humanity. We grieve for the first responders who rushed to offer aid and perished. And we grieve with all those who have suffered in anguish since. We pray for all those who have perished in wars the last decade, soldiers and civilians. We pray for Americans, Iraqis, Pakistanis, and Afghans. We pray for Christians, Jews, Muslims and other people of faith. And yes, O Lord, we pray for our enemies. Help us to bring about a new decade of peace between your people. Let us find a path that brings us from darkness to light. Open our hearts to new ways of creating moments of reconciliation. Lead us to create in our souls spaces of hope that sustain us. Ten years ago men of terror set the course for decade. The lives they stole will never be forgotten. In their precious memories, let us move forward as the children of God. By your grace, we pray we succeed. The evidence of our times is harsh. Still, I have hope. It is hope born out of my faith and from the experience of living through the last decade. "Fear Inc. | The Roots of the Islamophobia Network in America"
Click here to read the full report. This publication should be shared widely in our churches and across America. U.S. Rep. Peter King is planning another round of congressional hearing into "Muslim radicalization," reports NPR and other media outlets. The hearings are scheduled for June 15th. King held hearings earlier this year that were widely condemned by interfaith religious leaders. King's principle charge - one disputed by the FBI, Homeland Security and other anti-terrorism agencies - is that American Muslims have not condemned terrorism or that they even support it. At that time, The Rev. Dr. Michael Kinnamon, General Secretary of the National Council of Churches in Christ USA, firmly declared: "No matter what Rep. King may say, his hearings convey the implicit message that Muslims aren’t part of 'us'—and to this sort of bigotry, all citizens of conscience must say NO!" Let me repeat that Rep. King's hearings to investigate Muslim Americans are the definition of un-American. As I have said before, these hearings bring to mind the Salem witch trials and the McCarthy hearings, dark periods in this land. We should never forgot the lessons of those experiences. The U.S. House of Representatives should not be used as a venue for religious or political persecution. As crowds gather outside the White House to mark the stunning news announced tonight by President Barack Obama that the war criminal Osama bin Laden has been killed by U.S. forces there are fireworks going off in our NE Portland neighborhood. Let us pray together tonight - no matter our place in the world - for peace and reconciliation in the aftermath of years of terror and war. Tonight the president rightly said that "the US is not – and never will be – at war with Islam…Bin Laden was not a Muslim leader; he was a mass murderer of Muslims." That point, also made by President Bush in the days after 9/11, must never be forgotten. Tonight my prayers are with the victims of that terrible September day and their families. So to I pray for the young men and women of the U.S. Armed Forces. They have been at war for far too long and made great sacrifices. My prayers are also with President Obama and his staff. As I said last year on the ninth anniversary of 9/11, I still hope that ultimately good can come from that horrible act of war. As a follower of Jesus, the Prince of Peace, I also pray for my enemies tonight. Let those who embrace violence and terror set down their weapons and seek peace. There is nothing that justifies the acts of terror committed by Al Qaeda. Let those of us who are people of faith - regardless of our religion - be the ones who lead the way by bringing healing to a hurting world. This is yet another moment where we have the opportunity to seize history and work in interfaith partnership toward that peace all humanity desires but that continues to elude us. "Three Things Most People Don't Know about American Muslims"
1. Muslim Americans reject terrorism and extremism. Muslims are members of the American family and hold the same American values of religious freedom, respect and cooperation as other faith groups. Muslims in America are teachers, doctors, lawyers, members of our armed forces, and countless other important contributors to our society. It’s time to stop focusing on divisive stereotypes that weaken us as a society and work together to move the country we share forward. Learning the truth about our neighbors is the first step to building a stronger community. Click here to add your name to a pledge opposing these hearings. Peter King's anti-Muslim Congressional hearings get underway tomorrow just as news breaks that the bomb planted at an MLK march this January was allegedly left by someone with ties to white supremacists. This begs the question: Why is King - a man with terrorist ties of his own - only investigating Muslims and not violent extremism in general? A Stevens County man charged with the attempted bombing along the route of the Martin Luther King Jr. Day parade in Spokane has links to a neo-Nazi group, according to the Southern Poverty Law Center. Kevin William Harpham, 36, was a member of the neo-Nazi National Alliance in late 2004, Mark Potok, director of the center's Intelligence Project, said following Harpham's arrest Wednesday. The bomb was said to have been large enough to have caused mass casualties. As the Southern Poverty law Center notes, right-wing extremism and the threat of domestic terrorism (not from Muslims but from people who often self-identify as Christian) continues to grow in the United States. But we are ignoring that reality and focusing in only on Muslims even though the U.S. Department of Justice clearly has stated - despite Rep. King's claims - that U.S. Muslims are active partners in the fight against terrorism. Religious bigotry is the fuel for these hearings. In 2011, Americans are in danger of succumbing to a bigotry that will scar our generation in the same way that bigotry scarred those who came before us. Today, we look back on these horrifying events with anguished remorse; and yet I wonder if we’ve learned anything from history. Today, millions of Muslim Americans are subjected to thoughtless generalizations, open discrimination, and outright hostility because of a tiny minority whose acts of violence deny the teachings of the Quran and are denounced by other Muslims! No matter what Rep. King may say, his hearings convey the implicit message that Muslims aren’t part of “us”—and to this sort of bigotry, all citizens of conscience must say NO! When the family portrait of this country is painted, Muslims should have, must have, an honored place in it. As this indicates, Rep. King’s assertion that Muslims have not spoken out forcefully enough against extremism is simply wrong—indeed, it is slanderous. If he wants to investigate extremism, then do so—but do not target one entire religion! As General Secretary of the National Council of Churches, I care deeply about US security and about the wellbeing of Christians in places where extremism is prevalent. But so do millions of Muslims across this country! In the same way, the churches of the NCC affirm that we must care about the wellbeing, the dignity, of Muslims in our midst. On behalf of the fifty million members of our churches, I declare as loudly as possible that whenever Muslims are threatened or demeaned, so are we—because “today we are Muslims, too”! We all need to stand up against religious extremism, violence and bigotry wherever we might find it. But we shouldn't allow a witch hunt against an entire religion. It is un-American. New York, March 4, 2010 -- the general secretary of the National Council of Churches will be among the religious leaders addressing a 2 p.m. rally in Times Square Sunday to protest Congressional hearings aimed at investigating Muslims in the United States. The hearings are organized by Rep. Peter King (R-N.Y.), chair of the House Homeland Security committee. Critics say the hearings on Islam are reminiscent of McCarthyism and will tend to "demonize" Muslims. The Rev. Dr. Michael Kinnamon, NCC general secretary, has been at the forefront of activities supporting the freedom of religion for all U.S. residents, including Muslims who have been targets of anti-Islam discrimination and open attacks for years, especially in the decade following the terror attacks of September 11, 2001. Last year Kinnamon defended the building of the Cordoba Community Center and Mosque in downtown Manhattan, and helped organize an interfaith summit to protest a threat by a Florida church to burn the Quran. In earlier statements, Kinnamon has strongly affirmed religious liberty and tolerance for all groups. "We are made richer and deeper in our Christian community by our relationship with Muslim and Jewish groups." The March 6 rally, meeting under the banner, "I Am a Muslim, Too," is expected to be attended by more than 75 interfaith, nonprofit, governmental and civil liberties groups. Dr. Kinnamon was one of my professors at Eden Theological Seminary and I had the pleasure of working as his teaching assisant my final semester in 2005. Rep. King's hearings to investigate Muslim Americans are the definition of un-American. As I have said before, these hearings bring to mind the Salem witch trials and the McCarthy hearings, dark periods in this land. We should never forgot the lessons of those experiences. The U.S. House of Representatives should not be used as a venue for religious or political persecution. Incendiary statements from Ahmadinejad are nothing new for the assembled delegates. But tension grew as he recounted various conspiracy theories about the September 11 terrorist attacks in the U.S., driving multiple representatives from the hall. "Some segments within the US government orchestrated the attack," Ahmadinejad told the assembly. He followed with the claim that the attacks were aimed at reversing "the declining American economy and its scripts on the Middle East in order to save the Zionist regime. The majority of the American people, as well as most nations and politicians around the world, agree with this view." After that statement, delegates rose and exited the hall. Representatives from the U.S., the United Kingdom, Sweden, Australia, Belgium, Uruguay and Spain walked out while Ahmadinejad discussed claims that the U.S. was involved in the attacks or allowed them to happen as an excuse to go to war in Afghanistan and Iraq. Ahmadinejad is a dangerous and brutal leader. He kills his own people and calls for Israel to the wiped off the face of the earth. Iran, which has a long history of aggressive behavior and human rights violations, would be a threat to the world if their aspirations to develop nuclear weapons succeeded. The United Nations and the United States must do all in our power to support moderate and progressive elements within Iran that oppose Ahmadinejad. World religious leaders can play a constructive role as well by establishing dialog with the many religious leaders within Iran that seek peace over conflict. All the people of the world should applaud those delegates who today walked out of Ahmadinejad speech. U.S. Senator John McCain's promised filibuster of legislation that would have ended discrimination against gays and lesbians in the military will forever stain McCain's legacy. Along with men like Strom Thurmond, he will be remembered for using his seat of power to discriminate against a minority of his fellow Americans. And like Thurmond, McCain will forever be remembered as a hypocrite. We learned after Thurmond's death that while he had been fighting civil rights for African-Americans he had fathered a daughter with an African-American woman. We know as well that on September 11, 2001 a San Francisco resident, Mark Bingham, helped overpower the hijackers aboard flight United Flight 93. Bingham was a gay man who defended his country. 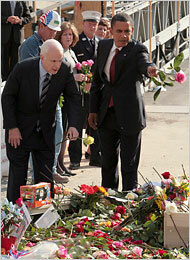 "I may very well owe my life to Mark," said McCain in the aftermath of 9/11. It was believed the terrorists hoped to crash their plane into the U.S. Capitol, where McCain was at work, or perhaps the White House. Bingham, a rugby player and business man, helped to overpower the terrorists. The plane crashed into a field in Pennsylvania and countless lives, including perhaps McCain's, were saved. Bingham once again showed Americans that sexual orientation shouldn't be used as factor on which to discrimination against people. A gay man helped save McCain's life on 9/11 and today McCain told all gay and lesbian Americans that their lives and contributions are not as valid as the sacrifices made by straight Americans. McCain's actions today were the worst kind of political hypocrisy. McCain not only dishonored Bingham's memory but dishonored all those who are gay and lesbian and who serve in our military. Today - September 11, 2010 - was the day a Florida pastor planned to burn the Qur'an. Now those plans seem cancelled. The world spoke out against his actions (including nearly 19,000 who joined the Facebook site People of Faith Against Burning the Qur'an). That Florida pastor is saying he cancelled the event because his goal of exposing the "radical" nature of Islam has been accomplished. Sadly, what he truly exposed is that all religions, including Christianity, have their extremists. The world, however, stood up to that extremism. Muslims called for restraint and peace. Christians and Jews stood in solidarity with Muslims across the globe. In an ironic twist, the extremist pastor from Florida helped to bring people of faith together and perhaps defused some of the growing tensions between the American people. Thousands of religious leaders -- myself included -- released a statement in the days after 9/11 entitled: "Deny Them Their Victory: A Religious Response to Terrorism." It read, in part: "We face deep and profound questions of what this attack on America will do to us as a nation. The terrorists have offered us a stark view of the world they would create, where the remedy to every human grievance and injustice is a resort to the random and cowardly violence of revenge -- even against the most innocent. Having taken thousands of our lives, attacked our national symbols, forced our political leaders to flee their chambers of governance, disrupted our work and families, and struck fear into the hearts of our children, the terrorists must feel victorious. But we can deny them their victory by refusing to submit to a world created in their image. Terrorism inflicts not only death and destruction but also emotional oppression to further its aims. We must not allow this terror to drive us away from being the people God has called us to be. We assert the vision of community, tolerance, compassion, justice, and the sacredness of human life, which lies at the heart of all our religious traditions. America must be a safe place for all our citizens in all their diversity. It is especially important that our citizens who share national origins, ethnicity, or religion with whoever attacked us are, themselves, protected among us." Our government didn't listen to that plea. It began an assault on Afghanistan that seemed more of an act of vengeance than a genuine effort to root out terrorists. Then we used the excuse of 9/11 to invade Iraq. Security experts have since warned that our actions have made the world less stable. In scripture, Jesus says: "You have heard that it was said, 'You shall love your neighbor and hate your enemy. But I say to you, love your enemies and pray for those who persecute you, so that you may be children of your Father in heaven; for he makes his sun rise on the evil and on the good, and sends rain on the righteous and on the unrighteous." We didn't listen to those words. We chose another path. Americans had just cause to go after those who conducted the terrorist attacks to prevent further violence. Yet our actions in both Afghanistan and Iraq violated the principles laid out by Thomas Aquinas and others in terms of what a "just war" should be. Our response was not proportional. It did not protect civilian lives. And in the case of Iraq, it was pre-emptive rather than in response to any attack on the United States. We never sought to build a genuine peace out of the ashes of war. Still we are not listening. The recent opposition to plans for a Muslim community center and mosque near the site of ground zero in New York, and the threats from a Florida church to publicly burn the Quran illustrate that anger, fear and even religious bigotry are some of the lessons we've taken away from 9/11. A fever seems to have taken hold of part of our people. Blind hatred seems to have replaced the desire for reconciliation and peace. Perhaps the experience of the last week will bring us closer together and reinforce the positive role religion can play in the quest for peace. I want to thank all those who became a fan of People of Faith Against the Burning of the Qur'an. Many of you sent respectful and heartfelt letters to the Florida church asking them to call off their plans. Others are attending events today to remember this 9/11. Let us all join in prayer today for the victims of that terrible day when religious extremists sought to divide the world. Let us pray for peace, reconciliation and justice. Again, thank you for standing up and being a witness for God's unyielding love. Your actions have brought hope alive again. Click here to read my op-ed on 9/11 published in The Oregonian. “And that’s what we’ve done over the last nine years. And we should take great pride in that. And I think it is absolutely important now for the overwhelming majority of the American people to hang on to that thing that is best in us, a belief in religious tolerance, clarity about who our enemies are -- our enemies are al Qaeda and their allies who are trying to kill us, but have killed more Muslims than just about anybody on Earth. We have to make sure that we don't start turning on each other. “With respect to the mosque in New York, I think I’ve been pretty clear on my position here, and that is, is that this country stands for the proposition that all men and women are created equal; that they have certain inalienable rights -- one of those inalienable rights is to practice their religion freely. And what that means is that if you could build a church on a site, you could build a synagogue on a site, if you could build a Hindu temple on a site, then you should be able to build a mosque on the site…. “The other reason it’s important for us to remember that is because we’ve got millions of Muslim Americans, our fellow citizens, in this country. They’re going to school with our kids. They’re our neighbors. They’re our friends. They’re our coworkers. And when we start acting as if their religion is somehow offensive, what are we saying to them? “I’ve got Muslims who are fighting in Afghanistan in the uniform of the United States armed services. They’re out there putting their lives on the line for us. And we’ve got to make sure that we are crystal-clear for our sakes and their sakes they are Americans and we honor their service. Two nights ago - upset that the Dove World Outreach Center had a Facebook page with 9,000+ fans cheering on their plan to burn copies of the Qur'an - I stared another Facebook page: People Of Faith Opposed To The Burning of the Qur'an. In under 48 hours, over 6,000 people have joined. But should we be giving this small church so much attention? The quick answer is yes. This is just the latest example in a rising sea of hostility and bigotry directed at Muslims (see Mosque, New York) in recent months. An emergency summit of American religious leaders representing many traditions - including Christians, Jews and Muslims - was held yesterday to speak out against this wave of hatred as we approach the ninth anniversary of 9/11. Just about everyone you can think of - from the Vatican to the World Council of Churches - has condemned Dove World Outreach Center's plans (though I've not yet heard far-right groups such as Focus on the Family weigh in...they're pretty busy bashing gays this week...something they share in common with Dove World Outreach Center). In any event, most mainstream religious leaders - conservative, moderate and progressive - have spoken out against this small church. Margret Mead once said: A small group of thoughtful people could change the world. Indeed, it's the only thing that ever has. The reverse can also be true. After all, it was a small group of Islamic extremists that attacked New York on 9/11 - killing people of all faiths, including Muslims. They changed the world. What has made so many people speak up against the Dove World Outreach Center is the collective feeling across religious lines that burning a Holy book is wrong no matter what. The church's hateful teachings on Islam (rants really) are theological malpractice. The pastor and members of Dove World Outreach Center make us feel like we have to take a shower after we see them on television or on the internet because of the filth they spew. Most people of faith - regardless of tradition - understand the Divine to be peaceful; concerned with justice and reconciliation (though we often disagree on exactly what that means). Our faith(s) compels us, regardless of differences, to stand united against hatred today the same way people of faith in America united against hate on September 11, 2001. We recognize evil when we see it. In the end, the Dove World Outreach Center might be doing us a favor (ironically). They're forcing Americans to confront the reality of religious bigotry directed at Muslims. The result of their actions may be to bring people together. Perhaps God is working through them in ways we don't fully understand. Join people of faith in support of the freedom to worship. Stop the War on Prayer. Religious bigotry is simply un-American. But we are seeing it today. In the video, posted by "lefthandedart," members of the crowd can be heard chanting "no mosque here," partially in the direction of an African-American man walking through the crowd. The man is wearing a white Under Armour cap that appears to given some members of the crowd the impression that he is Muslim. The man becomes frustrated, asking why the protesters are yelling at him and complaining that they don't know his opinion on the issue. Another man can be heard yelling something like "run away, coward." "I'm not even Muslim, but I've got my beliefs about this mosque," the African-American man tells a man who seems to be trying to calm him down. At that point, a protester in a blue hardhat confronts the man; other protesters quickly step in to separate the two. The "no mosque here" chant begins again. Later in the video, a man can be heard yelling, "he must have voted for Obama," while another appears to be complaining about media coverage. At another point, someone can also be heard yelling "Mohammed's a pig, Mohhamed's a pig" as the African-American man talks, after which a woman can be heard saying, "you don't need to say that." " #Mosque : Don't blame friends for acts of enemies"
....many mosque opponents argue, just because it can be built does not mean it should be. They say it would be disrespectful to the memories of those who died on 9/11 to build a Muslim facility near the World Trade Center site. I appreciate the depth of emotions at play, but respectfully suggest that the presence of a mosque is only inappropriate near ground zero if we unfairly associate Muslim Americans with the atrocities of the foreign al-Qaidaterrorists who attacked our nation. President Will Send 30,000 More Troops To Afghanistan. Are We On The Right Path? After escaping across the border into Pakistan in 2001 and 2002, al Qaeda's leadership established a safe haven there. Although a legitimate government was elected by the Afghan people, it's been hampered by corruption, the drug trade, an under-developed economy, and insufficient security forces. Over the last several years, the Taliban has maintained common cause with al Qaeda, as they both seek an overthrow of the Afghan government. Gradually, the Taliban has begun to control additional swaths of territory in Afghanistan, while engaging in increasingly brazen and devastating attacks of terrorism against the Pakistani people. Now, throughout this period, our troop levels in Afghanistan remained a fraction of what they were in Iraq. When I took office, we had just over 32,000 Americans serving in Afghanistan, compared to 160,000 in Iraq at the peak of the war. Commanders in Afghanistan repeatedly asked for support to deal with the reemergence of the Taliban, but these reinforcements did not arrive. The people of Afghanistan have endured violence for decades. They've been confronted with occupation -- by the Soviet Union, and then by foreign al Qaeda fighters who used Afghan land for their own purposes. So tonight, I want the Afghan people to understand -- America seeks an end to this era of war and suffering. We have no interest in occupying your country. We will support efforts by the Afghan government to open the door to those Taliban who abandon violence and respect the human rights of their fellow citizens. And we will seek a partnership with Afghanistan grounded in mutual respect -- to isolate those who destroy; to strengthen those who build; to hasten the day when our troops will leave; and to forge a lasting friendship in which America is your partner, and never your patron. But I heard no strategy for rebuilding the country and unless we are able to do that in partnership with the Afghan people and the world community there will never be real peace in that part of the globe. The modern equivalent of a Marshall Plan is needed for both Iraq and Afghanistan but such a plan did not seem central to the president’s vision. At the same time, the president made a good case tonight that a swift withdrawal of the United States would do nothing to serve either the security needs of the American or Afghan people. But will additional forces really make any long-term difference? … we call upon the U.S. Government to recognize that the continued presence of occupying forces has not provided meaningful security for Iraqi citizens and only exacerbates escalating violence, and begin an immediate phased withdrawal of American and coalition forces from Iraq with a timetable that provides for an expeditious final troop withdrawal. And we further call upon our government to link this withdrawal plan to benchmarks for rebuilding Iraqi society, since the reconstruction of infrastructure, the restoration of essential services, and a foundation for economic growth are necessary to nurture Iraqi hopes for a stable future, and to steps to meet the security concerns of all Iraqis, including the more vulnerable, smaller ethnic and religious communities. The U.S. should take no action that further harms the Afghan people. Any withdrawal here also needs to be linked to benchmarks. We are eager to see American troops come home. We don’t know whether Mr. Obama will be able to meet his July 2011 deadline to start drawing down forces. For that to happen, there will have to be a lot more success at training Afghan forces and improving the government’s effectiveness. Still, setting a deadline — so long as it is not set in stone — is a sound idea. Mr. Karzai and his aides need to know that America’s commitment is not open-ended. Mr. Obama’s generals and diplomats also need to know that their work will be closely monitored and reviewed. Otherwise, Mr. Obama will be hard pressed to keep his promise that this war, already the longest in American history, will not go on forever. It’s not clear how we will even pay for this war to continue. Congress needs to have an open and fair debate over these issues and America’s diverse religious communities in cooperation with the world faith community should seek to offer guidance both to U.S. officials and the public over how to best bring peace to the destabilized nation of Afghanistan. Little was said by the president tonight that offers me confidence that we are on the right course in the long-term. Nonetheless, I welcome President Obama's honest assessment of the difficulties faced by the U.S. – such a welcome change after the last president – and thoughtfulness. In a moment sure to provide memorable images, Barack Obama and John McCain will stand together in solidarity at the former site of the World Trade Center on the seventh anniversary of the Sept. 11, 2001, terrorist attacks. The campaigns jointly issued a statement today announcing a rare moment of unity in a campaign increasingly marked by sharply worded attacks. "On Thursday, we will put aside politics and come together to renew that unity, to honor the memory of each and every American who died, and to grieve with the families and friends who lost loved ones," said both senators in a statement. "We will also give thanks for the firefighters, police and emergency responders who set a heroic example of selfless service, and for the men and women who serve today in defense of the freedom and security that came under attack in New York City, at the Pentagon and in Shanksville, Pa."
I'm feeling a little bit better about the state of America right this moment. The 9/11 terrorists clearly hoped to destabilize the United States. Our president has unwittingly helped them to succeed. In response to the attacks President Bush has pursued policies that have helped to make America a weaker nation. Thankfully, the Supreme Court stood up again this week to defend the Constitutional principles that have made our nation a beacon of freedom. It shouldn't be necessary for the Supreme Court to tell the president that he can't have people taken into custody, spirited to a remote prison camp and held indefinitely, with no legal right to argue that they've been unjustly imprisoned -- not even on grounds of mistaken identity. But the president in question is, sigh, George W. Bush, who has taken a chainsaw to the rule of law with the same manic gusto he displays while clearing brush at his Texas ranch. So yesterday, for the third time, the high court made clear that the Decider has no authority to trash the fundamental principles of American jurisprudence. In ruling 5 to 4 that foreigners held at Guantanamo Bay have the right to challenge their detentions in federal court, the court cited the Constitution and the centuries-old concept of habeas corpus. Justice Anthony M. Kennedy's majority opinion seems broad and definitive enough to end the Kafkaesque farce at Guantanamo once and for all. "The laws and Constitution are designed to survive, and remain in force, in extraordinary times," Kennedy wrote. Again, it's amazing that any president of the United States would need to have such a basic concept spelled out for him. That reference to "extraordinary times" takes care of a specious argument that Bush and his legal minions have consistently tried to make: that when the nation is at war, as it has been since the Sept. 11, 2001, attacks, the president has extraordinary powers that allow him to do basically anything he wants. Religious leaders, of course, have been calling for the closure of Guantanamo Bay for years now. We've also pushed for the prohibition of torture. It is disappointing that John McCain has reversed course on so many of these issues and pledged support for the failed policies undertaken by President Bush. A moral society can not be maintained through the use of immoral means. U.S. intelligence has proven faulty at best but few would seriously doubt that Al-Qaeda wants to do serious harm to our nation and will do so if given the opportunity. Only the villains behind Al-Qaeda can be held responsible for the violence they wage but President George W. Bush’s policies have allowed Al-Qaeda to grow and remain a serious threat. More than two-thirds of the experts believe that Iraq is not the central front in the war on terrorism and 88 percent think that operations in Iraq are undermining U.S. national security…. The Bush administration’s misguided tactics in the fight against global terrorist networks are making the United States a more dangerous place. Eighty-two percent of the experts expect another 9/11-scale attack on the United States sometime in the next decade, and 83 percent believe that the Taliban, Hamas, and Hezbollah have all strengthened over the past year. An overwhelming 91 percent urge the United States to dramatically increase pressure on Pakistan, which many believe will become the next Al Qaeda stronghold. The United States needs to turn its attention away from Iraq if it hopes to contain these terrorist groups. If we are attacked again it would represent a failure of colossal proportions on the part of President Bush. The war in Iraq has only further destabilized the world and allowed terrorist networks to grow. Islamic fundamentalists killed thousands on 9/11 but the ensuing damage to our Constitutional democracy came not from the outside but from the far reaching attacks on civil liberalities undertaken by the Bush Administration. Today we can be glad that the U.S. Supreme Court “struck down the military commissions President Bush established to try suspected members of al-Qaeda, emphatically rejecting a signature Bush anti-terrorism measure and the broad assertion of executive power upon which the president had based it,” according to The Washington Post. The defense of our democracy must take place within Constitutional bounds. Sadly, this president has shown a certain level of contempt for the Constitution. We may find that this president has in the end done more harm to America than the terrorists. If we abandon our freedoms in response to terror then the terrorists have won. A few weeks ago during a Seattle radio interview I called Ann Coulter “nuts.” One caller said my words were unchristian but another blogger wrote to say calling her a “nut” was an act of Christian charity. Her interview this past week where she charged that 9/11 widows had enjoyed their husband’s deaths proved my point. Coulter is a dangerous woman who will do and say anything to divide Americans along political, religious and racial lines for political gain. She is a warrior for the most extreme elements of the far right in America. The art of politics ought to be about bringing Americans together to face difficult issues that have the potential to harm the health of the nation and the world. Is Coulter a Christian? I do not know what religious affiliation if any she claims. But her words and actions are unchristian and I hope that those in the Religious Right and those in the Republican Party disown her message and that the media stop covering her nutty rants. For our democracy to thrive our discourse needs to reject the hate-speech of Ann Coulter and embrace those voices who seek with intention to reconcile our people. 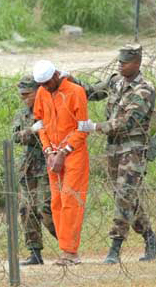 "Suicides at Guantanamo Bay prison lead to renewed calls to close the facility"
New York, June 11, 2006 -- The suicides of three prisoners at the Guantanamo Bay detention center in Cuba have prompted a renewed call by the National Council of Churches USA that the facility be closed. The suicides are "another milestone in a sordid history of human rights denial and crimes against humanity," said the Rev. Dr. Bob Edgar, NCC General Secretary. "Americans who love their country and its historic ideals are mortified by this continuing blot on our honor, on our steadfast defense of freedom, and on our commitment to democracy and the rule of law," Edgar said. Edgar also repeated a plea he made in February to Secretary of State Condoleeeza Rice that the NCC be allowed to send a small interfaith delegation to Guantanamo "to monitor the physical, mental and spiritual condition of the detainees." Rice has not responded to the request. Similar requests were turned down by former Secretary of State Colin Powell in 2003 and 2004. Last February, Edgar praised a United Nations report that called upon the U.S. to close Guantanamo, to refrain from "any practice amounting to torture," and either bring detainees to trial or "release them." The NCC Governing Board, composed of representatives of the council's member communions, has warned that the denials of human rights and freedoms "are not simply a crime against humanity; they are a sin against God." The deaths by suicide of three prisoners of the Guantanamo Bay detention facility are another milestone in a sordid history of human rights denial and crimes against humanity. As the Governing Board of the National Council of Churches USA made clear in February 2004, the denial of rights and freedoms are not simply crimes against human beings: they are sins against God. We urgently renew our call, made most recently on February 16, 2006, that the United States close its Guantanamo Bay detention facility without delay. We also renew our request to the Secretary of State that the National Council of Churches USA be allowed to send a small interfaith delegation to Guantanamo to monitor the physical, mental and spiritual condition of the detainees. It has been four months since the United Nations Commission on Human Rights called upon the U.S. to close Guantanamo, to refrain from "any practice amounting to torture," and either bring detainees to trial or "release them." The National Council of Churches USA immediately endorsed the U.N. report, and called upon the U.S. government to accept its recommendations. Since then, 75 detainees have staged hunger strikes to protest conditions in the jail. Amnesty International has described the facilities as "a legal black hole" where detainees are denied access to any court, legal counsel or family visits. "Denied their rights under international law and held in conditions which may amount to cruel, inhuman or degrading treatment," Amnesty reports, "the detainees face severe psychological distress." Americans who love their country and its historic ideals are mortified by this continuing blot on our honor, on our steadfast defense of freedom, and on our commitment to democracy and the rule of law. We appeal again to the President and to the Secretary of State: bring this cruel and humiliating chapter to an end. Close the Guantanamo Bay facility immediately. The National Council of Churches USA is composed of 35 Orthodox, Protestant, Episcopalian, historic African American and peace church traditions representing 45 million Christians in 100,000 congregations in the United States.